Card has a blank insert, envelope and comes in a clear plastic resealable bag. Payment by PayPal or bank deposit. Those large fringed flowers are incredible! I don't think I have seen any so nice in ages Jo! really unique What exactly have you put on the edges?. You definitely are the fringing queen! Where do you buy your rhinestones? they really give your work that extra class! The paper I used for the flowers comes from that bloke in Melbourne, it's two toned horizontally instead of vertically and has a white edge on the paper - would you believe it's the reject part of the roll or whatever??? not that the prices I pay reflect that He has paper that has a coloured edge as well, wacky colour combos but they work well in fringed flowers. Admin wrote: Where do you buy your rhinestones? they really give your work that extra class! 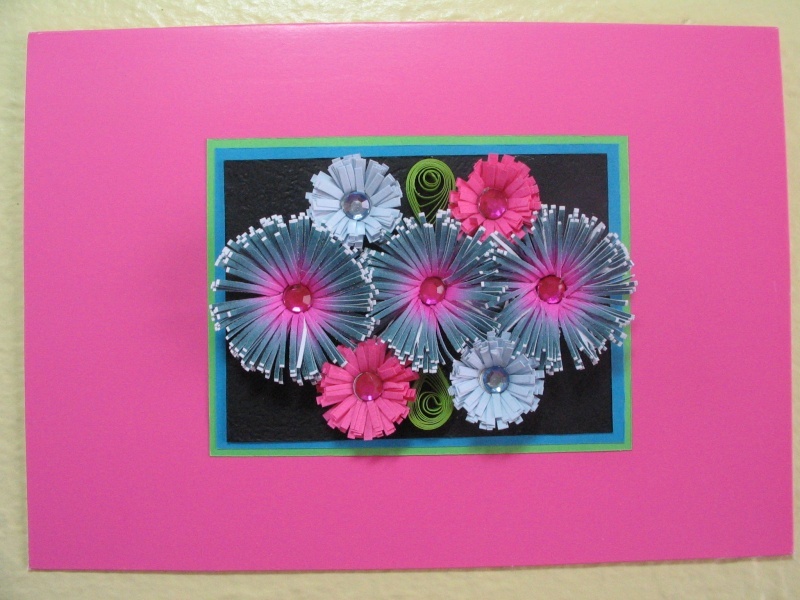 Rhinestones are Kasier Craft ones, got them from the $2 shop, have started using them and love them on the flowers. That is a really nice card Jo. What bloke in Melbourne do you get that paper from? Is it ok to have his name, so maybe I can see what he has to offer? 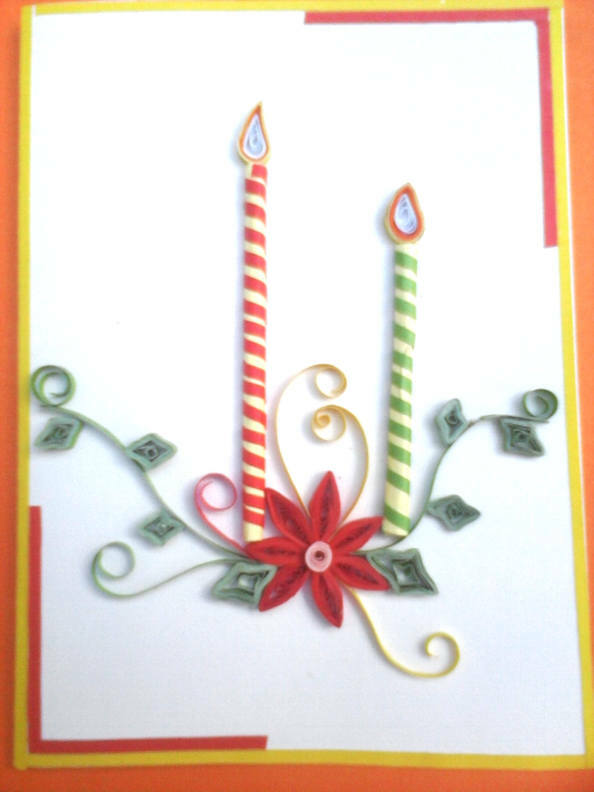 bZb wrote: That is a really nice card Jo. What bloke in Melbourne do you get that paper from? Is it ok to have his name, so maybe I can see what he has to offer? Thanks for the tip and info Karon! Guess what I am spending my holiday pay on?? 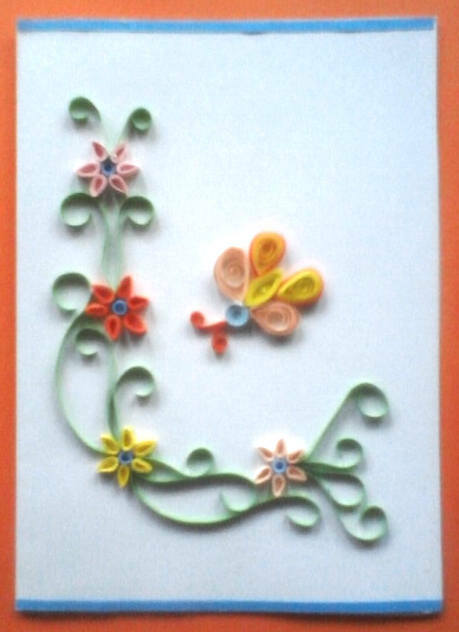 Yep you guessed right... quilling supplies!!! If you are getting one of his fringers, you will not look back. They are really expensive and I baulked at paying $130 but it was well worth it. I sell one that is $50 which my customers are fine with but if you are an avid quiller like us every day I would highly recommend it because it can really be refined to such fine cuts that no other fringer can do. Jo put me onto it as she is a fringing and I am so glad I got it. I think from memory she puts more than 1 strip through hers. The spring return is really responsive on it. Ever need any info just email or call me any time. I was hoping to get down to the airport and surprise you but just got way laid with all the family we have had for the past few months next time!! Thanks again Karon. I do appreciate you sharing this with me. And next time I am heading down I will definately let you know! Perhaps I can train out to caboolture or something and meet you out that way? At this point I don't think I am coming down again until late August, early September, but the dates haven't been confirmed yet, but will keep you posted!